Today we celebrate Darwin’s 203rd birthday and in his honor I will try and explain why I do not tolerate creationism. I received quite a few attacks – and even threats – in recent times by creationists who ask me to be more ‘open’ to the idea that their view might have some truth in it – funny how you could threaten someone and ask him to be open-minded at the same time. This new movement of primitive ignorance is gaining grounds in numerous countries – notably in the United States and the Arab World, including Lebanon. They wish to portray the Theory of Evolution as being merely one of several possibilities that would explain the present diversity of plant and animal life – Note: they usually don’t use big words so I’m translating. Here’s the thing: There never was a controversy. There never was a “creationist” vs “evolutionist” debate – you could say that it was settled in 1860 with Thomas Henry Huxley vs Samuel Wilbeforce. All there ever was was a battle between fiction and reality. I don’t mind if you believe that the planet is less than 10,000 years old. Seriously, I don’t. It’s your right to believe whatever you wish to believe. But given that the planet is actually about 4.54 billion years old, you can’t expect me to take anything you say seriously anymore. This would be equivalent to you telling me that you were engaged to a Swahili-speaking Invisible Pink Unicorn. I mean, I’d love to convince you that Invisible Unicorns don’t usually speak Swahili but hey, you’re free to believe that. The real problem comes when you decide to express your opinion as being anything more than just an opinion. When you try and present that opinion as a fact that supposedly challenges “other facts” or other “versions of the truth”. And, especially, when you start forcing your delusions on helpless children. No-one should tolerate a creationist anymore than one should tolerate a gravity-denier or a flat-earther. Why? because superstitions, I claim, can be extremely dangerous. Why does it even matter? why can’t we all have our own beliefs? How would you feel if someone was convinced that cancer doesn’t exist and that no matter how overwhelming the evidence for the presence of cancer is, he refuses to accept it? You wouldn’t really care if he was a senile old man in his room rambling nonsense but what if he was in power? What if we were told to respect his opinion as being equally likely to the ‘opinion’ of scientists who claim that cancer does in fact exist? Would we do that? No, we sure as hell would not. We must all be outraged over the fact that superstition is making its way into our science classes. Today, an increasing number of creationists are given biology posts. I even met a microbiology teacher at the American University of Beirut – with a PhD – who doesn’t acknowledge the fact of evolution. These are people who are asked to teach science to our children and who don’t even acknowledge scientific evidence. Imagine an Oncology professor not believing in Cancer, wouldn’t you find it odd that he or she teaches Oncology? Wouldn’t you feel that you might have problems with future patients if you followed his or her advice? This is what’s happening today. Creationists’ manifestation of their scientific illiteracy is now threatening the very notion of a science class. They are willing to force their delusions into the minds of young children and deprive them of the right to have an education. I visited CERN yesterday – the international organization whose purpose is to operate the world’s largest particle physics laboratory – and I find it disgraceful that such a thing as a ‘creation museum‘ even exists. The fact that we have CERN and a Creation Museum on the same planet really shows how advanced we’ve got in the pursuit of truth and, at the same time, in the nurture of our delusions. That men and women are actually capable of wasting such a massive amount of their time on financing the denial of reality is mind-baffling in our 21st century. It is by definition impossible to have an educated discussion with creationists because their positions are inherently dependent upon ignorance and intellectual dishonesty. So what I usually do is talk facts and facts only. This is sufficient to convince any man or woman who really wants to understand and know the truth. After all, some people – maybe most – might simply be unaware of the vast amount of evidence supporting the Theory of Evolution. They might confuse the scientific term “theory” with the one we non-scientists use. They might be unaware of the techniques used to date things and phenomenons, or the difference between descendants and common ancestors etc. But for those with advanced university degrees, they have no excuses. We must stop tolerating ignorance. I acknowledge the fact that creationism has nothing to do in a biology course. However, your article does raise some serious issues, especially with that intolerance tone you take in it. For all these reasons, humility and intellectual modesty are a necessity for progress. It is always tempting to take a journalistic style, draw a hasty picture of the debate, leave out the parts we are uncomfortable with, and call for the systematic immolation of creationists, but I guess that is exactly what you hate about creationists! (And that is how Copernicus died, right?) Intolerance leads to stagnation, hence death. That’s not what science is about, is it? Second, and most importantly, isn’t it possible that you, while denouncing the heresy of creationists today, are making the exact same fundamental fault that they typically make? Isn’t possible that ‘genuine’ creationism and evolutionism aren’t necessarily opposed? Isn’t possible that ‘genuine’ creationism and evolutionism are answers to very different questions, thus cannot possibly contradict one another? As in international trade, openness always benefits all parties. So be open. I’ll respond to each part on its own. Firstly, yes Science has its own limitations and noone has ever denied that. But there being a limitation in science doesn not automaticaly give some possibility for superstition to be true. You’ve just done what you warned me not to do: you’ve been intellectually dishonest. Your comment seems sophisticated so I’m going to assume you know what Theory means in science. There is nothing personal in all of this. I’ve had quite a few “debates” – if we can call them that – with creationists and at no point would I ever make it personal. Creationists refuse to present any scientific fact to support their Hypothesis and yet ask of us to respect their opinions. Well no, either give evidence or at least be honest and say that you have none. I’ve dealt with the rest of your first part in my post. Secondly, it is possible yes but there’s nothing I wrote in this post that would suggest that. I was clear. You have all the rights in the world to believe whatever you wish to believe but don’t expect me to take it seriously just for the sake of acknowledging something. Why should I? I don’t take seriously someone who tells me that he or she believes Earthquakes are the results of Two gigantic invisible Kangaroos boxing each other because I’ve got no reason to do so. Science isn’t a game where anyone can enter. It’s not like you can claim to have factual evidence for what you’re saying and yet refuse to present it. Creationists refuse to present any scientific fact to support their hypothesis, simply because they are none (thankfully). And when a creationist claims that he or she can prove that, in reality, the universe was created in 7 days, and surprisingly enough that Time itself was created in the 3rd day, please do ask him/her how did we manage to measure the first 2 days in this case! Creationism is an eventual answer to the question ‘Why do we exist, and what is the point of our existence?’. Science is not game as you say, so it does not , and should not, care for such ‘light-headed’ questions. Why light-headed? Because those questions cannot be fully answered using measured data. Saying that a certain true purpose of life can be scientifically proven, is actually dangerous: just imagine a scientific article that draws an irrefutable conclusion stating that humans exist to serve the two kangaroo-overlords during their existence and should stop any activity not related to kangaroos welfare! Freedom of choice? Emancipation? Imagination? Nonsense, science has proved that fundamentally you are here to serve the Invisible Kangaroos, so get back to your work! Does that mean that the invisible kangaroos do not exist and should not be taken seriously? Well, no. It means that the invisible kangaroos might be a possible part of the Truth (not reality, truth), because apparently they are an answer for someone. Why should I care? Because at some point of our lives as constrained, real, material human beings, we will inevitably be faced with the alarming question ‘Why do I exist, for what reason, for what purpose?’. Pure hazard? Boxing Kangaroos in need for servants? A full set of semi-human creatures living on clouds feeding on nectar and ambrosia in need for entertainment? It is only in this matter that you are free to believe in whatever you choose to believe as long as it is ‘spiritually’ coherent and sound (which is very easy to achieve in fact), and I should take what you say seriously not only by respect, but most importantly because your answer might be a part of the one I am looking for, or even better, the exact opposite. Saves me time looking. Conclusion? Openness in this issue means that you have indeed asked yourself this question in the proper form, that you realize that you’re soon (I use the term loosely) to be dead, and that you are a responsible conscious rational human. So, again be open. I’m glad we don’t really disagree then. 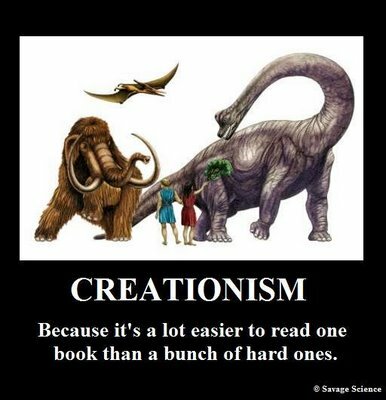 I would just make a clear distinction between what people call creationism – that is that they really believe that everything was created in 7 days some thousands of years – and what people call religion. Questions of meaning and all those that are related have nothing to do with science by definition. To be honest, I don’t really see the connection between what you’re saying and what I wrote. Well, unless I have misunderstood what you meant to say, but you stated that it is impossible to have an educated conversation with a creationist, and that you are interested in facts, and facts only, and that we should stop tolerating ignorance. My point is : no, creationism is not ignorance, facts have nothing to do with it, and you just had an educated (well I suppose) conversation with a creationist. You did misunderstand. You can have an educated conversation with a creationist, just not about Creationism or Evolution because the position that Creationists takes vis-a-vis scientific data is inherently dependent upon ignorance. But you’vre written too much things that have nothing to do with what I wrote so forgive me for not responding to everything. I don’t mean to be rude, for you seem engaged in civil and factual conversation -to which I give you kudos- but your posts are quite ambiguous and seem to make a lot of non-points concerning non-issues. You claim that creationism is the final, ultimate answer to “Why are we here? What is our purpose?” To start with, the question “Why are we here?” is quite misleading in its intent. For our purposes I’d replace it with the question “How did we come to be?” That is, as far as I can tell at the time of this writing, an unambiguous question that creationism answers. Creationist discourse is, in fact, only concerned with the circumstances that led to the advent of mankind. Moving on, I find the question “What is the point of our existence?” to be irrelevant, simply because creationism does not deal with this issue. Again, creationism is only about the circumstances that led to the birth of Homo sapiens sapiens; the origin of any entity does not dictate its purpose. Science does not care for the “purpose” question you say. Well, I hate to disappoint, but it does. Science is concerned with all questions, some are just set aside because there are no empirical means or grounds on which to approach them yet. Of course you simply state that there is no way to answer with measured data, as if that’s an irrefutable fact. It’s a rather close-minded assumption to say so. The future of knowledge is far, far beyond imagining, and claiming what data we can and can’t collect in the future is very nearsighted at most. Enter your absurd hypothetical. Scientists agree that there is a specific purpose to our existence. First things first, you say it’s dangerous. All knowledge is dangerous, big deal. Next you say the purpose of our creation treads on our free will and emancipation. Nonsense. If we were made for a purpose, that doesn’t mean we can’t do anything else. Viagra was created with the purpose of relieving blood pressure, I’d say it has emancipated from that purpose quite well. Hasn’t it? For some reason, that’s not even your point. You go on about a very definite Truth that has a very capital “T” and that is absolutely not to be mistaken with reality. I’m afraid I don’t grasp this sort of truth and its unreality (or perhaps fiction I daresay?) You go on about the importance of the “purpose” question, but I’m afraid I already said we’re not really discussing that when we talk of creationism (see paragraph 2.) Your tolerance for other beliefs is duly noted and appreciated, but the matter at hand is not one of beliefs and spiritual wellness, it’s one of facts. Here comes the conclusion! The proverbial meat and potatoes! Creationists are not people with a funny and harmless belief. Creationists look at piles of evidence in the face and shun it (Young Earth, Creation Science), or try to mold it into their preconceived, baseless notions (Intelligent Design, Theistic Evolution.) In any case, it returns a certainly, indubitably, unquestionably incorrect belief. But that’s not the worst part. Creationists actively try to present these falsehoods as facts. Sir, you call yourself a creationist but you seem to disagree with them. I urge you to reconsider what you call yourself.You are a creationist if you consider any belief present here: http://en.wikipedia.org/wiki/Creationism factual, then I have to respectfully tell you that you are wrong or at least avoiding the question, and that presenting that belief as fact is intolerable. Hooray for arguing on the internet!